SpongeBob: Good morning Krusty Krab! (sees Squidward) Oops. Sorry Squidward. Didn't see you there. Squidward: (Still smiling) Not a problem SpongeBob. Not a problem at all! Squidward: Good morning sir! Welcome to the Krusty Krab. Squidward: One Krabby Patty coming up! Mr. Krabs: Mr. Squidward, you're in a chipper mood this morning. Did you get an order of fancy decorative soaps in the mail or something? Mother: Ooh, ooh, terribly sorry, sir. Squidward: (growls) I can't take this anymore! Mr. Krabs: Nice to have ya back Squidward. Squidward: This is an outrage! I will no longer tolerate my personal items being soiled by the ravels that crawls in this restaurant! I demand a place to put my stuff. Mr. Krabs: Hmm, okay. Uh, I suppose you could put it with the nacho cheese. No one's got near that in years. Mr. Krabs: Bikini Bottom Labor Regulations? Ew, gross! (grows hives) Get that thing away from me. It's giving me hives! Squidward: It specifically states that all employers must provide his or her employees with a secure, clean place to store personal property. Mr. Krabs: Aah, blast you Squidward. You drive a hard bargain. I guess I could rustle somthing up for ya. Mr. Krabs: Oh, here we go! Found it! SpongeBob: Who is that Mr. Krabs? Mr. Krabs: Uh, appears to be Corporal Sterling, lad. Heh...forgot all about that prank. 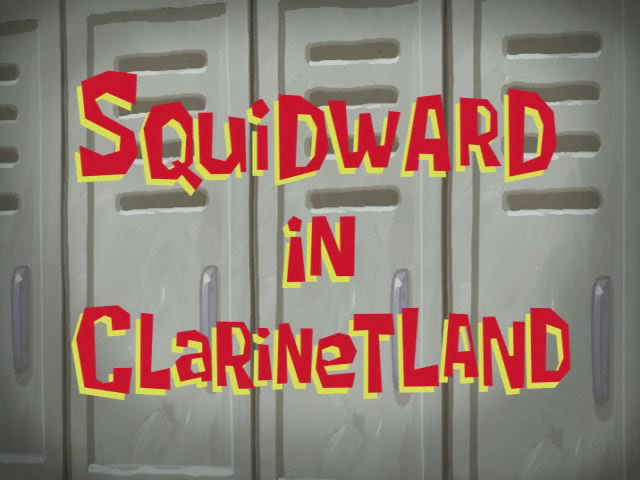 (empties the locker) Squidward, your locker is ready. SpongeBob: Ooh, do we get to share our lockers like we share hairnets? Squidward: Not in a whale's age. Mr. Krabs: Now, not so fast, Mr. Squidward. The law requires that all employees have a secure place for personal items. So you are required by law to share. Squidward: Oh, I suppose I can share, but only since it requires by law. Hey, this thing is filthy! You don't expect me to clean it? Mr. Krabs: Blimey! She hasn't sparkled like this since boot camp. Carry on, boys. Squidward: Impressive indeed. Just keep your grubby little hands to your side. SpongeBob: You got it, Squidward. Finally I have a clean place to store my toothbrush. Squidward: Just don't touch my clarinet! SpongeBob: I promise nothing untoward will happen. Squidward: Order up, SpongeBob. (walks over to SpongeBob who is looking in the locker) SpongeBob! What do you think you're doing? You're supposed to be fry-cooking. I told you not to touch my stuff! SpongeBob: I didn't. I wore protective gloves. And besides, don't you like how classy it look now? Squidward: I hope you're not trying to shove the boxes into that locker. SpongeBob: Too late. it's already done. SpongeBob: Don't worry Squidward. There's plenty of room! (SpongeBob and Squidward walk inside the locker) I expanded a bit. Squidward: Well it's all fine and dandy, but where's my clarinet? SpongeBob: Well, that's simple. We just simply consult the card catalog and find Squidward's Clarinet drawer 36.8-B. (opens drawer and it shows Squidward's clarinet) See? Squidward: Fine. but remember, it is vitally important that nothing happens to it. Squidward: Eat up. (drilling noises are heard in the back) What's he doing? Customer #3: May I order please? Customer #3: I'll have... (drill whirring) Is everything ok back there? Squidward: My clarinet! SpongeBob! (opens locker and goes inside) SpongeBob? There. 36.8-B. (opens drawer and gasps) A note? SpongeBob: Item has temporarily moved during reconstruction. Relocated to shelf 1018.2-E.
Squidward: SpongeBob! 1018.2-E. (opens drawer) Another note? SpongeBob: Oops! Did I say 1018.2-E? I meant 2019.3-M. Sorry. Eagle Head: I am the keeper of the Horn-ed forest. State your business here. Squidward: I-I'm trying to find my clarinet. Eagle Head: A clarinet is not owned. Why don't you tell me why your really here? Eagle Head: I don't appreciate your tone. Squidward: I-I'm sorry. I-I didn't mean to offend you. Eagle Head: This is a sacred place, where clarinets live without persecution. You need to learn respect. Squidward: (Eagle squeezes Squidward) I've...learned. I've learned respect. Patrick: I win! I win! (grabs Squidward and holds him in his palm) Hey! What are you doing here? Squidward: You tell me what in the wide world of sports is this place? And how did you get so big? Patrick: Hmm, must be all the pressure. Squidward: What are you talking about? Patrick: It must be...the pressure. (ground starts shaking) I gotta get out of here! SpongeBob: Squidward, are you okay? Squidward: (mumbling) It was such a nightmare! SpongeBob: Squidward, what are you trying to say, buddy? Squidward: (coughs and pants) I tried to get my clarinet in there and it's impossible. Squidward: (gulps) Where did you get that? SpongeBob: Well, with all the ruckus you were making over it, I kept it with me just to make sure it was safe. (Squidward growls) Call it a friendly gesture! Director: Are you ready, Mr. Squidward? SpongeBob: Hi, Squidward! You wouldn't believe what I had to go through to get here. (Squidward screams and runs out) Hmm. I was just going to bring him his clarinet.